Over 1 billion people all over the world smoke cigarette, and about 15 billion cigarette sticks are sold globally every day. Half of those who are long-term smokers are very much likely to die from the toxic effects of the tobacco smoke because it contains over 4000 cancer-causing chemicals. Moreover, those who do not smoke but are constantly exposed to the tobacco smoke from active smokers have a higher risk of developing some chest diseases. About 9 out of every 10 persons who develop lung cancer are long-term tobacco smokers. Those who smoke more number of cigarettes per day for many years have the highest risk of developing lung cancer. If the affected person starts complaining of things like bone pain, headache, dizziness, weakness of the arms and legs or having convulsions, it means the cancer may have spread from the lungs to other parts of the body such as the brain, the spinal cord and the bones. For smokers who don’t have any of the above complaints, the best thing to do now is to stop smoking. Those who are addicted and can’t stop easily, should enroll in a rehabilitation program with a clinical psychologist or a psychiatrist. While doing this, they should visit a good hospital to see a doctor who is an expert in chest medicine for a full medical checkup to uncover any findings in the lungs associated with cancer. 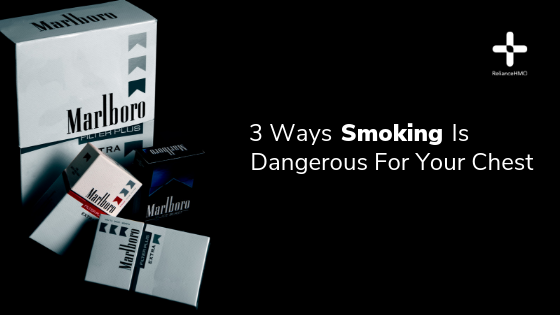 Taking these steps will significantly reduce the risk of developing lung cancer if they are still cancer-free. This is known as chronic obstructive pulmonary disease (COPD) by doctors and manifests in two forms. The first one is characterised by the obstruction of the person’s airways (the lower branches of the windpipe) from excessive production of mucus by the walls of these airways. This prevents adequate air from reaching the lungs, leading to shortness of breath and frequent coughing up of sputum. Over time, such a person goes into heart failure, with swelling of their body and weight gain. The second form of this lung obstruction disease is called emphysema which simply means presence of excess air in the lungs. This is due to the destruction of the airways and tiny structures in the lungs (called alveoli) responsible for adding oxygen to the blood. Inadequate addition of oxygen to the blood leads to difficulty with breathing, cough that does not produce any sputum and poor distribution of oxygen to every part of the body. Subsequently, the affected person begins to lose weight. Long-term tobacco smoking is the direct cause of most cases of lung obstruction disease. Any chronic cigarette smoker above the age of 40 is at a very high risk of developing this disease, especially if he is a man. The risk of developing lung obstruction disease is significantly reduced in chronic smokers if they quit smoking, especially those below the age of 40. This is the cancer affecting anywhere along the oesophagus. It is very deadly because its treatment (surgery) is highly risky as the patient can die from it and when patients survive, their quality of life is significantly reduced. Moreover, people, especially children, who don’t smoke but are constantly exposed to the smoke from cigarette are at risk of developing chest diseases like pneumonia and even any of the two types of cancer discussed above. Prevention will always remain the best medicine because smoking is the single largest preventable cause of many diseases and premature death in people according to the World Health Organisation. This means that if a smoker decides to stop smoking today, he or she has significantly cut down the risk of developing many diseases and dying prematurely. Previous Post Previous post: What is the commonest cause of death in Pregnancy?